BLOOMFIELD, Conn. (CNS) — Pastoral leaders of episcopal Region I South have taken to heart the encuentro call to be a church in mission that engages and forms Hispanic Catholic youth and young adults to live out their missionary vocation. That was evident in young adults being invited to share their experiences at the region’s encuentro, or encounter, at St. Thomas Seminary in Bloomfield May 12. Reaching out to Hispanic/Latino youth and young adults has been a top priority of the U.S. Catholic Church’s multiyear process leading up to V Encuentro, or the National Fifth Encuentro, in Texas in September. Luna, 24, was one of four young leaders from the Archdiocese of Hartford and the Bridgeport and Norwich dioceses, in Connecticut, and the Springfield Diocese, who shared their testimonies with 300 delegates. Luna, whose mother was born in Puerto Rico, said that church leaders she met at her parish’s encuentro have supported her and other youth leaders by asking for their opinions, listening and offering ways to “pass the baton” of ministry. “My experience with V Encuentro has been very informative and very transformative,” said Luna. She was hired as a program coordinator in the Springfield diocesan Office of Faith Formation in February, right before a diocese-wide encuentro. “It was eye-opening to see so many of the parish communities felt the same way and how we could meet eye to eye where we should be looking toward,” she said. 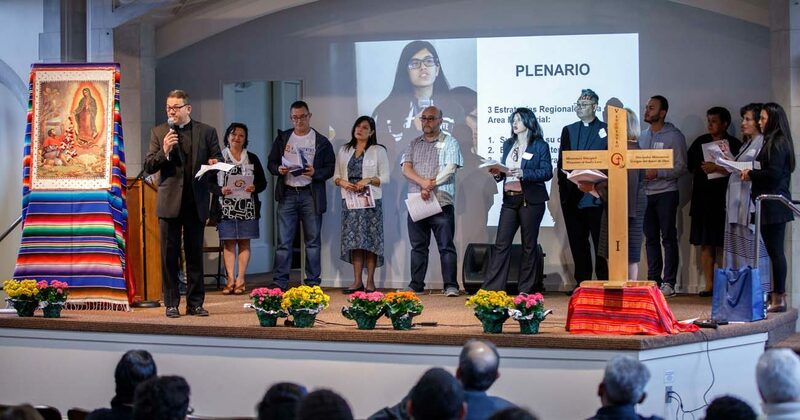 She added that the encuentro provides pastoral ministers with resources to strengthen the faith of practicing Catholics and provide the tools to reach out to those who have left the church. “We can accompany them wherever they are in their journey if we reach out to them with compassion, understanding and openness,” she said. For Leonidas Mateo, 28, from the Diocese of Bridgeport, V Encuentro also offers a helpful way to truly listen to other young people, especially teenagers who might be struggling with low self-esteem, and make them feel valued. Encuentro is one of the ways young people’s voices can be heard. Like Mateo and Luna, Romer Santana, 27, was another young adult embracing a leadership role as a result of the encuentro. “The call to be missionaries in action really impacted me,” said Santana, a youth ministry leader at All Saints/Todos los Santos Parish in Waterbury, Connecticut, in the Hartford Archdiocese. Santana, who was born in the Dominican Republic, said he would like more training to continue engaging other parish youths. “Encuentro is lighting a fire for people who were not really active in church and is making people get involved,” Santana said. At the regional encuentro, Santana and the other young adults who gave testimonials worked in small groups to address issues concerning youth ministry. Inspired by her parish encuentro and reminded of how feeling loved and accepted by God changed her life, Jessica Rodriguez, 34, decided to revive a prayer group at her parish in the Diocese of Norwich. “V Encuentro is about action and prayer. We need to be united and we need to lift up our ‘jovenes’ (youth) and not judge them,” Rodriguez said. Feeling like they belong in church, especially when they are struggling, can help young people who are seeking solace in God, she told CNS. But sometimes youth face only criticism based on past mistakes or are judged by their looks when they show up at a parish.